"These are ‘three snowflake’ apartments, with a higher level of comfort and more space than the average, ‘two snowflake’ French apartments that we sell. The Les Pleiades Apartments are great for families and beginners who are looking to have a good value ski trip. Remember to pack food and tea bags when you go – it will be much cheaper than in resort!" 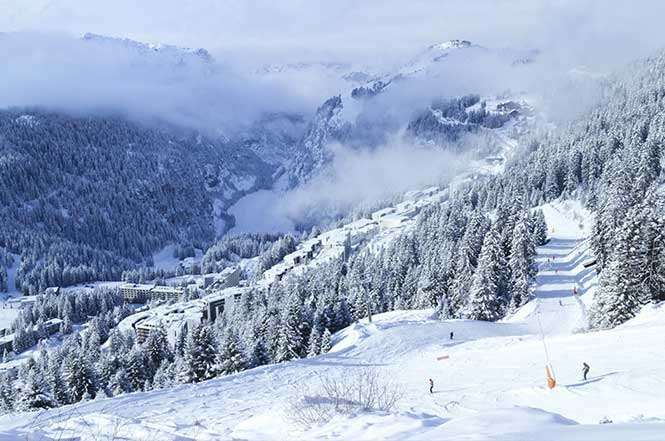 Situated in the Flaine Foret area and just 100m from the Gerats ski lift and 200m from the shopping centre, these apartments offer stunning views of the surrounding area from their large balconies. The apartments themselves are light, spacious and well equipped. All apartments are south- facing and have a fully-equipped kitchenette with oven, hot plates (2 in 32m2 apartments, otherwise 4) and dishwasher, TV, balcony, ski locker and bathroom with bath and wc or a separate wc. 1 Bedroom Apartments (2-4 people): [Approx. 32m2]. Bedroom with a double bed and living area with a single sofa bed and a pull-out bed. 1 Bedroom Cabine Apartments (2-6 people): [Approx. 40m2]. Bedroom with a double bed, cabine with bunk beds and a living area with a single sofa bed and pull out bed, with an extra shower room. 2 Bedroom Cabine Apartments (2-8 people): [Approx. 57-62m2]. One double and one twin bedroom, a small bedroom with bunk beds and a living area with a single sofa bed and pull-out bed, with an extra shower room.